If I could get a do over in my life, the one thing I would not have done, was added chemicals to my hair. Pictured here, I was five years old with thick curly hair. I did not like getting my hair combed. My mother favored hot water and grease to manage my ponytails. The summer after my sixth grade graduation, my mom put a relaxer in my hair because she was sick of wrestling with it. I was a curious child so I paid attention to everything. 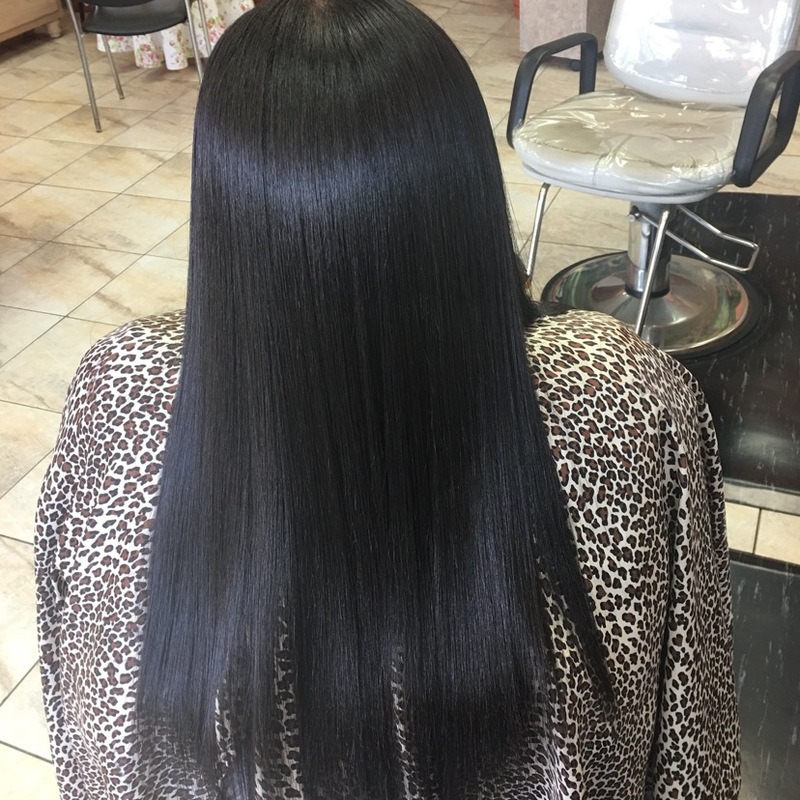 I noticed how, after the relaxer was in place, my hair stretched unbelievably in length. I was amazed and hooked. Every thirty days I noticed the puffy new growth of my original texture creeping back in, which, back then, was embarrassing, so I’d buy a box of perm and correct that issue before anyone would see it. Before long, during my seventh grade year, I was using cool-aide to color my hair. I would switch the colors from cherry red to grape then blue raspberry as frequently as every two days. That didn’t last too long, I moved over to rinses, tinting and bleaching so I could enjoy a cute reddish or honey blond effect; Sometimes using streaks of bleach mixed with a rinse to obtain a trio color of red, honey blond and white. At that time it was so pretty, but, I had no idea of the damage that would later come. My hair was long and healthy, even after the chemical treatments, I could still see my natural curls fighting for attention, but following my mother’s rituals, I kept on with perming my hair. By the time I made it to high school, I had cut, colored and chemilized my hair so many times that I looked different on every picture I took. Pictured here, in my ROTC uniform, I was a freshman with a bob hairstyle and streaks of honey blond. I’ve always had a good grade of hair, even when chemicalized with a relaxer, also known as a perm, to keep my hair bone straight, my hair was still, naturally curly, when it was wet. I could never control my true texture of curls. My hair had grown so long, yet it was very weak from all I had done to it over the years. After years of damage, I decided to cut all my hair off (for the third time) in 2004 to start fresh, but I started with perms again! Lack of knowledge made it difficult to for me to start fresh naturally. Pictured here, five years later from the big chop, my hair was growing back slowly but healthy this time, maybe because, I left the color alone and the perms were conducted twice a year instead of every month. In 2012, my hair had hit a growth stump, I couldn’t get it to grow for nothing!!! I was frustrated. 🤦🏽‍♀️ Pictured here, I was at a stand still from the 2004 chop so I figured this was it for me. My hair had been much longer than this, but I couldn’t get it to grow any longer than this. In 2013, I noticed a turn of the times. Every woman I bumped into chopped their hair off and started over naturally. Everywhere I looked, I saw fros, twist, Love, high buns, nappy naturals, natural hair events and more! It had become an epidemic. I wasn’t willing to cut my hair off again so I just did away with the perms COMPLETELY! I was a beauty school drop out, but I did remember from school, that hydration from a leave in conditioner was the magic trick! So I began to transition, wearing my relaxed hair at the ends and wearing my new growth curly hair at the roots, and so it began. My hair began to grow like wild fire! Transitioning from chemicals to natural was not an easy decision. I went through phases where I had two hair textures which caused my tresses to stay tangled and sometimes matted. No matter how frustrated, I kept up with the fight of conditioning and twisting EVERY SINGLE DAY until I had no more perm on my hair.